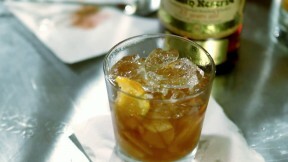 Julian Van Winkle, of the old Rip Van Winkle distillery, shows David Chang how to make a perfect Old Fashioned cocktail in episode 3, Memory, which explores Chang’s past. Add a slice of fresh orange to a rocks glass. Get some raw brown sugar cubes, usually found at a store like Whole Foods. If you cannot find cubes, just regular raw sugar works. Add one or two cubes worth of sugar. Add 2 or 3 drops of orange bitters and 2 to 3 drops of Angostura bitters to the sugar. If you have sugar cubes, place the two cubes on a cocktail napkin placed on top of the glass after dropping the bitters into the cubes, then dump them into the glass with the orange. The napkin soaks up the excess bitters. Throw away the napkin. Add a very few drops of whiskey. Muddle the sugar with the fruit, but not the peel, until the sugar is almost dissolved. Muddling the peel releases a bitter taste from the rind. Add 1-1/2 to 2 ounces of whiskey (15-year, 107 proof Pappy VW is the best). Stir with some good ice cubes. Stir some more. Add more bourbon if you like. The drink will change dramatically as the ice melts.